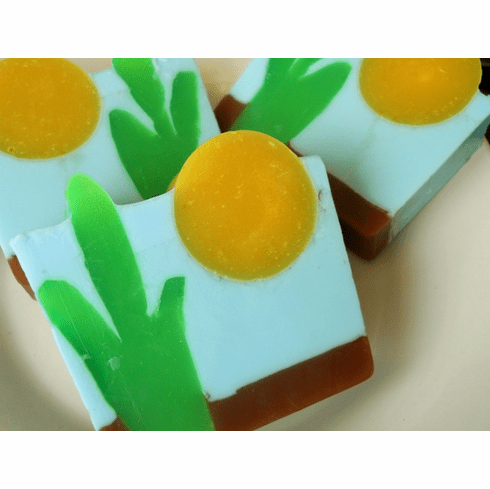 With notes of fresh, succulent cactus finely tuned with hints of amber and clean ocean spray, this desert-inspired, cactus soap not only smells divine, it will leave your skin soft to the touch. I added heaps of nourishing oils to this homemade glycerin soap for a creamy, cleansing lather that will provide moisture to skin without any heavy residue. Comes beautifully packaged in printed cellophane with a bow and label. Weighs approximately 5.5 oz. This soap is vegan friendly and unisex. Ingredients: 100% vegetable glycerin soap (coconut oil and palm oil based), sunflower oil, avocado oil, olive oil, fragrance.